With Calvin Johnson sidelined with a knee injury today at Green Bay, the Lions' offense will obviously have a different look. This Johnson announcement was a surprise since he was listed as questionable and the other two questionable Lions (Chris Houston, Glover Quin) are active. It’s not unusual for him to miss a practice so not a shocker when he missed on Wednesday and Thursday. Here’s the thing, the Lions obviously knew they could be without him so they have game-planned accordingly. — Matthew Stafford has to spread it out against a weak pass defense (ranked 28th in the NFL). 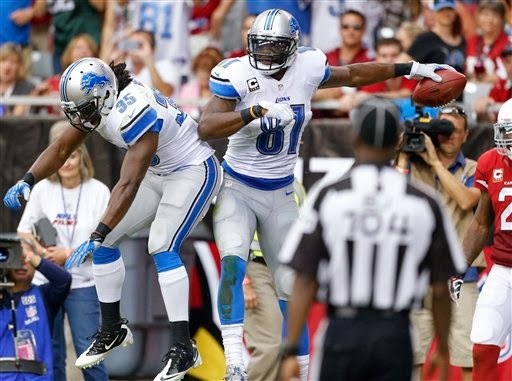 He’s got Kris Durham, Ryan Broyles and Patrick Edwards to use as targets along with newcomer Kevin Ogletree. But also he’ll use the tight ends and running backs in the passing game. Last week he completed passes to two wide receivers, two running backs and two tight ends. — Reggie Bush’s day just got much more difficult. With no need to double-team Johnson, they’ll stack the box against Bush. — Look for Kris Durham to be targeted early and often. His role has been gradually increasing. Durham had a big game at Lambeau Field last season with a 27-yard, one-handed catch. — Kevin Ogletree, who was signed this week and practiced for the first time on Thursday, is active. Expect to see him on the outside with Johnson out. Although he can line up in the slot. — Patrick Edwards, who has missed the last two games with an ankle injury, is active today. Look to see him use his speed on the outside.